KM 629, copper, VS 1965 = AD 1908, approx 22mm across. KM 713, small silver coin, approx 14mm across, nice UNC, VS 1996 = AD 1939, scarce type. KM 322, silver, approx. 21mm across, original toning and nice patina. KM 501, silver, approx. 21mm across, original toning and nice patina. KM 564, silver, approx. 21mm across, original toning and nice patina. KM 601, silver, approx. 21mm across, original toning and nice patina. KM 299, silver, approx 17mm across, scarce type and denomination, NS 774 = AD 1654. 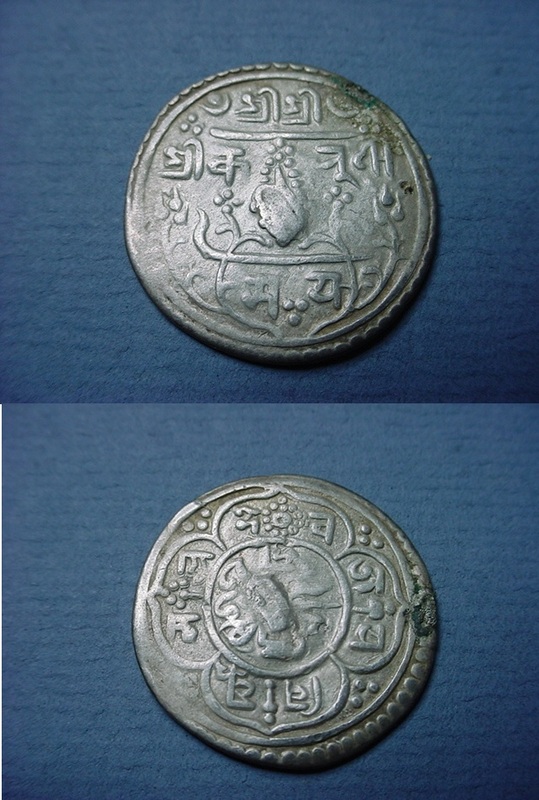 KM 82, silver, approx 18mm across, scarce type and denomination, Jaya Bhupatindra Malla, dated NS 816 = AD 1696. 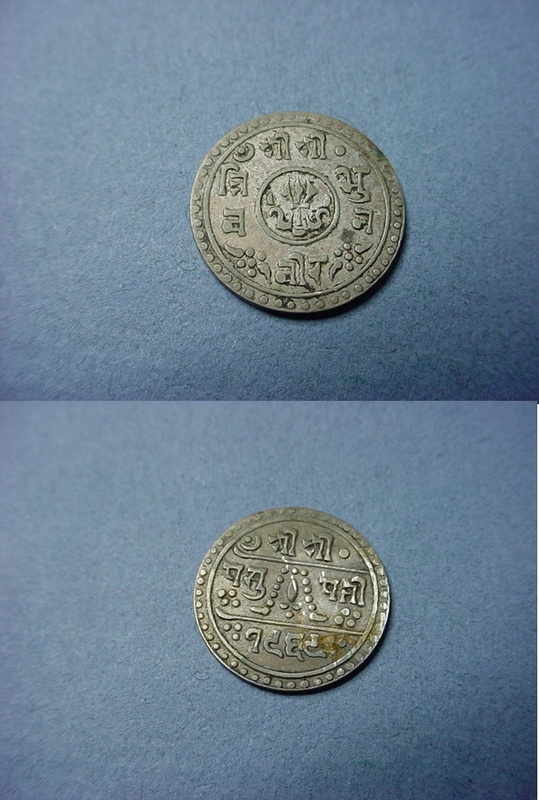 KM 223, silver, approx 17mm across, scarce type and denomination, Mahindra Simha (1715-1722), dated NS 835 = AD 1715. KM 234, silver, approx 16mm across, scarce type and denomination, Kumudin Devi as regent for Jaya Prakash (1735-1746), dated NS 856 = AD 1715. 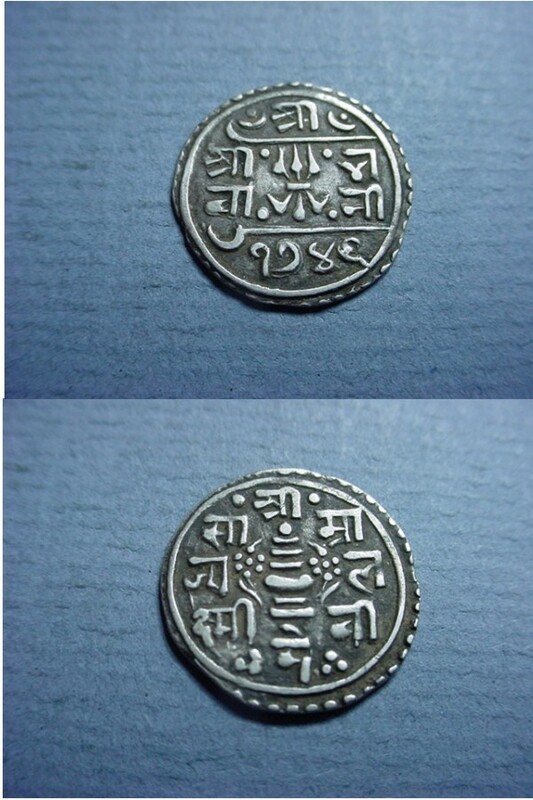 KM 228, silver, approx 17mm across, scarce type and denomination, Mahindra Simha (1715-1722), dated NS 838 = AD 1718. KM 232, silver, approx 16mm across, dated NS 842 = AD 1722. KM 233, silver, approx 16mm across, dated NS 842 = AD 1722. KM 392, silver, approx 17mm across, scarce type and denomination, dated NS 849 = AD 1729. KM 290, silver, approx 17mm across, scarce type and denomination, Jyoti Prakash Malla, dated NS 873 = AD 1753. KM 558, dated SE 1746 = AD 1824, silver, interesting design, approx 18mm across, scarce type and denomination, original toning. KM 642, silver, approx 18mm across, SE 1816 = AD 1895, cool item. KM 643, silver, approx 18mm across, SE 1827 = AD 1905, cool item. KM 644, silver, approx 18mm across, SE 1833 = AD 1911, cool item. KM 603.2, silver, THICK, nice grade, approx 27mm across SE 1801 = AD 1879, a nice coin. KM 166. Kingdom of Kathmandu. 1661 AD, 781 NS. Double mohar silver. Extremely rare. KM 592, copper, approx 27mm across, scarce type, average grade, soft strike, dated VS 1790 = AD 1867. KM 689.2, copper, approx 27mm across, scarce type, nice grade, KM price has not changed in over 20 years, dated VS 1985 = AD 1928, possible contemporary? KM 658, silver, 22 grams, approx 30mm across, great shape, special presentation striking that has very sharp details and "special" die work. 54125 Nepal Medieval Square Copper AD 1500 RARE! A pretty rare medieval square coin, listed in Rhodes as #173, from 1500-1525, approx 12mm square. KM 301, dated NE 751 = AD 1631, silver, Siddhi Narasimha Malla, interesting design, approx 27mm across, nice lion, nice grade. KM 163, 25mm across, a nice silver coin, interesting pattern, NS 761 = 1641, Kingdom of Kathmandu, Pratapa Malla, nice original old toning, a nice coin. KM 164, 25mm across, a nice silver coin, interesting pattern, NS 775 = AD 1655, Kingdom of Kathmandu, Pratap Malla, a nice coin. Kingdom of Patan Mallas, 1663 AD, 783 NS. 1 mohar silver. Date outside circle. KM 177, one year type, silver, approx 25mm across, scarce coin, KM value way too low, Mahipatendra Malla (1670), one of only 2 coins of the ruler, original old toning. KM 185, one year type, silver, approx 25mm across, scarce coin, KM value way too low, Jaya Nripendra Malla (1674-1680). KM 454.1, dated Saka 1676 = AD 1754, silver, Prithvi Narayan Shah, interesting design, approx 27mm across, very nice grade, and bold strike, removed from mount, original old toning. KM 325, silver, approx 26mm across, great design, original patina, NS 805 = AD 1685, very scarce item, bold strike, slight double striking on one side, some original luster. Kingdom of Patan. Yoga Narendra Malla. 806 NS, 1686 AD. 1 mohar silver. KM 326, lovely original XF, approx 25mm across, very cool design, original old toning, a wonderful coin. KM 454.2, dated Saka 1691 = AD 1769, silver, Prithvi Narayan Shah, interesting design, approx 27mm across, very nice grade, and bold strike, original old toning. KM 208, Jaya Bhupalendra Malla, NS 812 = AD 1692, nice shape, approx 25mm across. KM 454.2, dated Saka 1694 = AD 1772, silver, Prithvi Narayan Shah, interesting design, approx 27mm across, very nice grade, and bold strike, original old toning. KM 320, silver, approx 26mm across, great design, original patina, NS 820 = 1700, very scarce item. 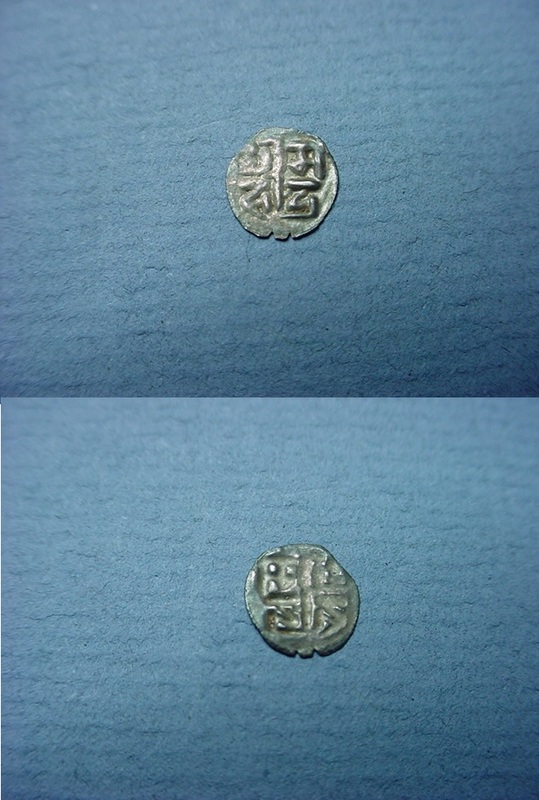 KM 217, dated NS 821 = AD 1701, silver, interesting design, approx 27mm across, very much above average grade and strike, one year type, Jaya Baskara Malla (1701-1715). KM 357, silver, approx 28mm across, Kingdom of Patan, Jaya Indira Malla dated NS 826 = AD 1706. KM 370, dated NS 829 = AD 1709, silver, Jaya Vira Mahindra Malla, interesting design, approx 27mm across, very nice grade, original toning. KM 377, dated NS 831 = AD 1711, silver, interesting design, approx 27mm across, weakness in the strike here and there as is common, Jaya Vira Mahendra Malla. KM 386, dated NS 832 = AD 1712, Jaya Yoga Prakasa Malla, silver, nice old toning, interesting design, approx 27mm across, above average grade. 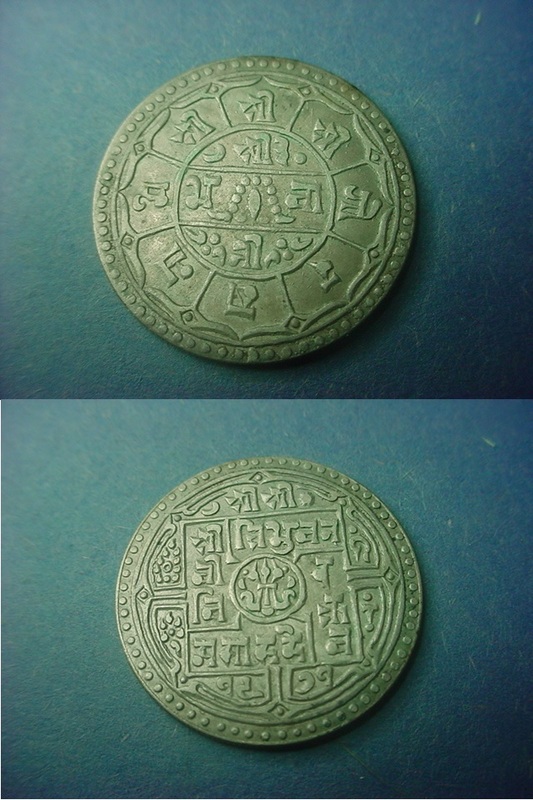 KM 225, dated NE 835 = AD 1715, silver, Jaya Vira Mahendra Malla, interesting design, approx 27mm across, very nice grade. KM 375, dated NS 835 = AD 1715, silver, interesting design, approx 27mm across, Hrdi Narasimha Malla, far better than average grade, original old toning. 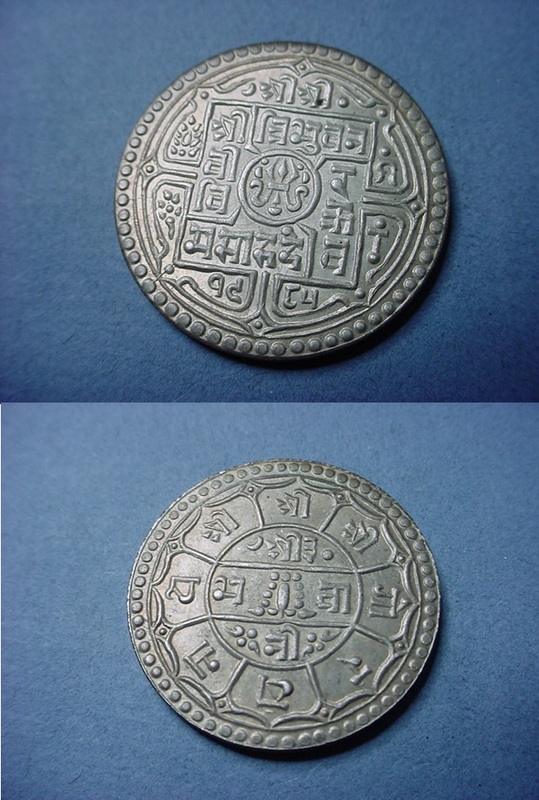 KM 108, dated NS 842 = AD 1722, Jaya Ranajit Malla, silver, interesting design, approx 27mm across, interesting item, made for use in Tibet for trade, called a "black tangka" because they were often made black after minting, weakly struck in spots as is common. 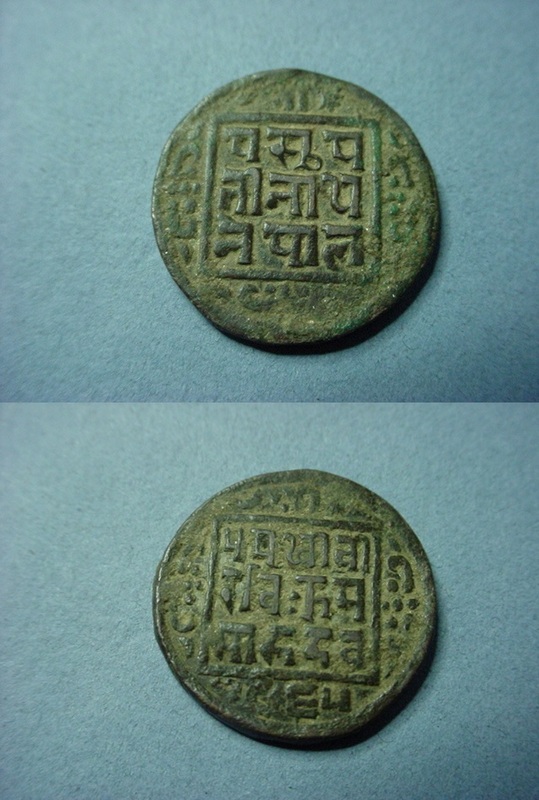 KM 230, Kingdom of Kathmandu, Jaya Jagajjaya Malla, approx 25mm across, 842 NS= 1722 AD. KM 394, silver, approx 26mm across, great design, NS 849 = 1729, very scarce item. KM 395, silver, approx 26mm across, mount removed as shown, great design, NS 849 = 1729, very scarce item. KM 397, silver, approx 26mm across, great design, NS 849 = 1729, very scarce item. KM 399, silver, approx 26mm across, great design, NS 849 = 1729, very scarce item. KM 400, dated NS 851 = AD 1731, silver, carefully removed from mount as shown, interesting design, approx 27mm across, Jaya Vishnu Malla, above average grade, original old toning, crude & uneven strike as typical. 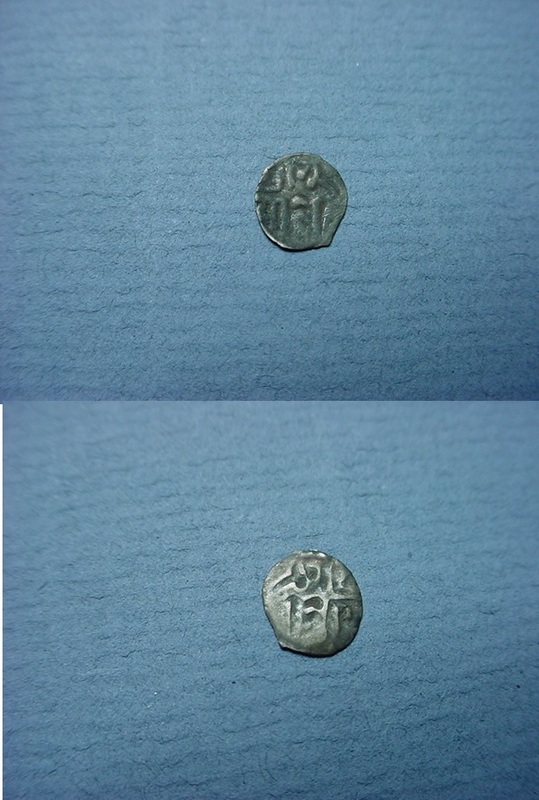 KM 259, dated NS 856 = AD 1736, silver, nice grade, interesting design, Jaya Prakash Malla, approx 27mm across. KM 409, silver, Kingdom of Patan, 1736 AD, 856 NS. 1 mohar silver. Kingdom of Kathmandu. Jaya Rajga Prakasa Malla. 856 NS, 1736 AD. 1 mohar silver. KM 280, silver, approx 27mm across, Kingdom of Kathmandu, Jaya Prakasa Malla, dated 866 NS = 1746 AD. KM 260, silver, approx 30mm across, interesting design, dated NS 873 = AD 1753, Jaya Prakasa Malla, weakly struck in areas as is common. KM 281, silver, approx 27mm across, Kingdom of Kathmandu, Jaya Prakasa Malla, dated 877 NS = 1757 AD. KM 231, Kingdom of Kathmandu, Jaya Prakasa Malla, NS 878 = AD 1758, silver, small mount mark as shown, approx 23mm across, average strike, original toning. KM 437, silver, approx 29mm across, NS 885 = 1765, counterstamped? KM 472.1, silver, approx 30mm across, great design, SE 1697 = AD 1775, Pratap Simka Shah, scarce item, original old toning. KM 472.2, silver, approx 30mm across, great design, SE 1698 = AD 1776, Pratap Simka Shah, scarce item, original old toning. KM 502.2, aprox 24mm across, a nice silver coin, interesting pattern, SE 1712 = 1790, nice original old toning, nice grade, Rana Bahadur (1777-1798). KM 529, dated Saka 1730 = AD 1808, silver, Girvana Yuddha Vikrama Shah, interesting design, approx 27mm across, nice grade, and a bold strike. KM 565.2, approx 27mm across, a nice silver coin, interesting pattern, SE 1766 = AD 1844, Rajendra Vikrama Shah (1816-1847), oriignal old toning. KM 602, silver, Surendra Vikrama Saha, interesting design, approx 27mm across, nice grade, a bit of weakness in the strike here and there as is typical, original old toning. KM 602, dated Saka 1780 = AD 1858, silver, Surendra Vikrama Saha, crude contemporary counterfeit that is clearly silver plated copper. KM 651.2, 27mm across, a nice silver coin, interesting pattern, original XF and nice toning, SE 1827 = AD 1905. KM 588, scarce item, nice strike and grade for the type, approx 23mm across. KM 589, scarce item, nice strike and grade for the type, approx 23mm across. KM 590, scarce item, nice strike and grade for the type, approx 23mm across. KM 626, copper, approx 23mm across, VS 1948 = AD 1891, 1 paisa, Prithva BB Shah, cool item, nice shape. KM 685, scarce item, nice strike and grade for the type, approx 23mm across. KM 493.1, not dated, silver, interesting design, approx 14mm across, scarce type and denomination, original toning. KM 464, dated SE 1692 = AD 1770, silver, interesting design, approx 18mm across, scarce type and denomination, wavy flan, original toning. KM 470.1, dated SE 1699 = AD 1777, silver, interesting design, approx 18mm across, scarce type and denomination, original toning. KM 470.2, dated SE 1700 = AD 1778, silver, interesting design, approx 18mm across, scarce type and denomination, original toning. KM 496, dated SE 1716 = AD 1794, silver, interesting design, approx 18mm across, scarce type and denomination, original toning. KM 497, dated SE 1723 = AD 1801, silver, interesting design, approx 18mm across, scarce type and denomination, original toning. KM 557, not dated, silver, interesting design, approx 14mm across, scarce type and denomination, original toning. KM 556, not dated, silver, interesting design, approx 14mm across, scarce type and denomination, original toning, (SHRI) above sword. KM 533, Rhodes 766, dated Saka 1725 = AD 1803, silver, Girvana Yuddha Vikrama Shah, interesting design, approx 31mm across, nice grade, and a bold strike, very scarce coin. Brass struck contemporary of KM 108, Rhodes 565, dated NS 842 = AD 1722, Jaya Ranajit Malla, interesting design, crudely struck on an uneven flan as shown, approx 27mm across. Interesting item, made for use in Tibet for trade, called a "black tangka" because they were often made black after minting, weakly struck in spots as is common.